I see you and me as pilgrims in a beautiful, intriguing and often perplexing world. We have inherited political, cultural, social and religious stories. How are we to make sense of them? You have a unique story to tell – a unique perspective from which to view the world. You are invited to tell your story and to share your insights at this website. I think of myself as a pilgrim in pursuit of goodness, truth, beauty and genuine insight. I hope you will engage in the discussion of my blog, books, features and articles – especially if you are on a similar pilgrimage. "With warmth, perception and sympathy, Roger Steer describes the life long journey of John Stott." My wife, Sheila, and I are looking forward to attending the opening of Mary Jones World at Llanycil, Bala, north Wales, this Sunday 5 October 2014 – the bicentenary of the death of Thomas Charles from whom Mary received her Bible at the end of her long walk across Welsh mountains. Mary Jones World is the realisation of a dream Bible Society has been praying for – to see the story of Mary Jones and Thomas Charles told to a new generation. A new state-of-the-art visitor and education centre will give residents of Bala, Gwynedd and Wales the chance to learn about the Bible’s impact not only on the Welsh nation but the world. For a wider audience the centre will celebrate the birth of Bible Society which has grown from its roots in the foothills of the majestic Snowdonia National Park to nearly 150 Bible Societies around the world. Here, then, is the nineteenth and final instalment of the story of how Mary Jones and Thomas Charles triggered a mission to the world. In 1965, when two members of the staff of the National Library of Wales were dismantling the library at Bala College, David Jenkins and Bryn Williams came across a Welsh Bible, printed in 1799. Inside they found a manuscript note. Lydia Williams’s Bible, Mary Jones’s niece, who lived with her. On her deathbed, Lydia gave her Bible that is this one, to me, namely one of the three given to Mary Jones by Mr Charles. When the College gave Mary Jones’s own Bible to the Bible House, Dr Lewis Edwards knew where this one was. When preaching in Penrhyndeudraeth, he called at my house and who was I to refuse Dr. Edwards? I entrusted it to him, gladly, yet sadly. The note was signed by Lizzie Rowlands. Mary gave one of her Bibles to her mother’s cousin, Ann Richards, of Ty’neithen, Bryncrug. Her name appeared in this Bible and Lydia was her granddaughter. Lydia, as we saw, had handed the Bible to Dr Edwards. David Jenkins brought the Bible to Aberystwyth to be kept with the Calvinistic Methodist Archives housed in the National Library of Wales where you can see it today. The popularity of the Mary Jones story continued unabated and in the same year (1965) it was translated into Thai, one of forty languages in which you can read the story. In March 1965, a letter was published in the magazine County Quest from Lizzie Rowland’s daughter, Mrs. Margaret Dunn, aged 91. 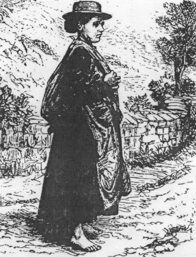 She reported that her mother knew Mary Jones well and used to read the Bible to her: “My mother heard the story of the walk to Bala many times… Mr Charles gave her three Bibles. Lydia [Williams], Mary’s niece, gave the third Bible to my mother”. Mrs Dunn was unaware, but was later informed, that this Bible was held by the National Library of Wales. Another is in Bible Society’s collection in Cambridge University library. The third is lost. In 1967, an article by Monica Davies was published in The Journal of the Historical Society of the Presbyterian Church of Wales which gave previously unpublished information about Lizzie Rowlands and her connection with Mary Jones in her final years. I used this information in the story I told above about Mary as an old lady. Many groups and individuals are regularly inspired to follow in the footsteps of a remarkable fifteen-year-old girl who walked twenty-six miles across the side of a mountain to buy a Welsh Bible from a Methodist Minister. The route Mary is believed to have taken is now a recognised long distance walk and Bible Society has published a bilingual walking guide for those wishing to follow in her footsteps. Walkers on this trail experience some of the loveliest scenery anywhere in the world. They can identify with Mary herself even though they enjoy incomes and comforts beyond Mary’s wildest dreams. In these surroundings, cut off from the bustle of modern life and amid scenery which has not greatly changed since her day, they are able to make a leap of imagination across 200 years. They may reflect on the faith which drove Mary to undertake such a demanding walk and how far their own commitment falls short of hers. Thomas Charles was so impressed by the enthusiasm that Mary Jones and others demonstrated to read the Scriptures in their own language that he made the case in London for a special Society to provide affordable Welsh Bibles. His colleagues on a small committee quickly saw that such a Society was indeed needed – but that Bibles in the language of the people must be made available not just in Wales but throughout the world. The story of Bible Society is a remarkable strand in the last two centuries of British history. Indeed when we think of the Bible Houses the Society built, bought or renovated whether in Port Said, Addis Abba, Warsaw, London, Shanghai, Vienna or Kobe it is a strand of British history which has physically left its mark around the globe. The human story you have read has an intriguing blend of charm and irony. Mary Jones’s 80-year-long life was poor and hard – but not without its joys, interests and sense of purpose. At the age of 70 she gave a half-sovereign to the Society’s appeal to print and circulate a million Chinese New Testaments and lived through almost the whole of the Society’s 52 years at its first Bible House. The Society whose formation she had unwittingly triggered quickly attracted within its orbit Kings, Queens, Princesses, a Russian Tsar, an Ethiopian Emperor, Prime Ministers, Governor-Generals, Chancellors of the Exchequer, reforming Earls, political campaigners, Archbishops, Bishops, Patriarchs and the initial hostility of Popes! Mary was delighted to receive three Bibles and incidentally prompted an international movement with profound repercussions for the spread of the gospel to rich and poor throughout the world. You can read the whole story of Mary Jones and Bible Society in my book Good News for the World published by Monarch Books in 2004. Please consider sharing it via these links. What was the bishop doing in Ilfracombe? Copyright 2012 Roger Steer - All rights reserved.